At Ardent, signal integrity is our passion. Our products are conceived through a dedicated approach by our engineers to solve today’s signal integrity challenges in variable environment. Ardent Concepts, Inc., a leading designer and manufacturer of high performance GHz connectors used in the development of next generation semiconductor applications and systems, has been awarded a U.S. Patent for its innovative TR Multicoax series connectors. Focused on contraction and expansion in controlled-impedance cable termination, the patent is the third pertaining to the TR Multicoax series and one of over 20 held by Ardent’s founder and Chief Technology Officer, Gordon Vinther. “At Ardent, signal integrity is our passion. Our products are conceived through a dedicated approach by our engineers to solve today’s signal integrity challenges in variable environments,” said Vinther. “For our IP portfolio, were looking towards tomorrows challenges. It’s a testament to our commitment to support our customers as they march towards the next generation of computing." This new patent specifically benefits Ardent in manufacturing multi-GHz (Gbps) connectors with continued thermal stability over wider temperature ranges. 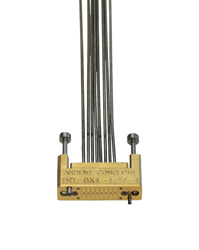 Ardent connectors can be used in applications like quantum computing where superconducting materials like Niobium-titanium are required. Connectors in these applications must operate at temperatures down to 4 Kelvin. Ardent Concepts is a leading designer and manufacturer of high performance multicoax assemblies, probes, connectors, and sockets used in the development of next generation semiconductors and electronics systems. Our core technology is the smallest, fastest, most electrically efficient compression mount connector technology worldwide. It is used to connect integrated circuits and printed circuit boards to instrumentation and to each other offering superior signal integrity in a high speed environment. Markets for our products include: Semiconductor, Test & Measurement, Military/Aerospace, Communications and Medical. http://www.ardentconcepts.com.